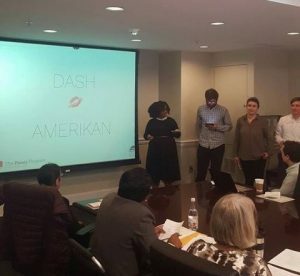 On Tuesday, March 20th the Praxis 2016-2017 Cohort was awarded first place for their project “Dash-Amerikan: Keeping up with Kardashian Media Ecologies” at the 2017 Huskey Research Exhibition, hosted by the University of Virgina Graduate School of Arts and Sciences. 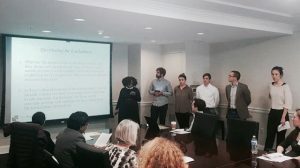 They will be presenting their findings again in early May. Until then, here is the abstract of their presentation to wet your appetite! In 2015, the season premiere of Keeping Up with the Kardashians was the most viewed Sunday cable program, out performing the series finale of the critically acclaimed television drama, Mad Men. Kim and company have never received the critical adulation that Don Draper elicited. Yet the Kardashians’ sheer popularity demands further inspection by scholars who claim interest in the cultural productions that reflect and shape our current historical moment. The Kardashians remain particularly important for their ability to normalize a matriarchal family structure and transform the traditionally private sphere of the home into their center of business, all while maintaining heteronormative assumptions about the objectification of women. Furthermore, their use of Twitter, Instagram, mobile apps, online blogs, and even tabloid coverage work together to engage fans in an unending advertisement for their show. Whether commenting on news events, promoting awareness of the Armenian genocide, or producing extravagant television specials, the Kardashian family has harnessed the 24/7 media landscape in new and unprecedented ways. The 2016-2017 Praxis Cohort examines the Kardashian media empire to reveal the discursive power of celebrities, fans, and their critics. To do so, we created a data set of every tweet written by a member of the Kardashian family, as well as every relevant US Weekly article, by using web scraping, text analysis, and topic modeling techniques. Using these digital humanities methods, we aim to interrogate constructions of race, class, and sexuality in contemporary popular culture and the pervasiveness of social media on our daily lives. Please join me in congratulating Jordan Buysse, Alicia Caticha, Alyssa Collins, Justin Greelee, Sarah Mceleney, and Joseph Thompson. Cite this post: Alicia Caticha. “Congratulations to the Praxis 2016-2017 Cohort”. Published March 24, 2017. https://scholarslab.lib.virginia.edu/blog/congratulations-to-the-praxis-2016-2017-cohort/. Accessed on .